What if you could transform your phone instantly, so someone else paid the bill, you had a different number, and no one even knew it was you calling? That sounds like a great option for a secret agent, but there are reasons regular folks would do it too. If you carry two phones right now — one for work and one for fun — you might want to do something like that. Or if you travel, you might like the idea that you could turn your US phone into a European one quickly and easily. The technology isn’t new, and it does work… kind of. Let me explain. Practically every phone today has the ability to work with LTE. LTE is the most advanced form of the GSM cellular standard that AT&T has used for over a decade. Other carriers used to use other technologies, but finally in the US you’re starting to see everyone standardize on LTE. LTE uses something called a Subscriber Identity Module (SIM.) A SIM contains information specific to the phone and the carrier you want to use. It’s the technology that lets carriers route calls and data to your phone. I’m sure you’ve seen SIM cards before you looked at the top of this article. They’re pinky-nail sized bits of plastic with a little bit of gold on them. The gold covers up a computer chip that has all the information that makes your phone special to you. In very new phones this technology is built in so there’s no card. 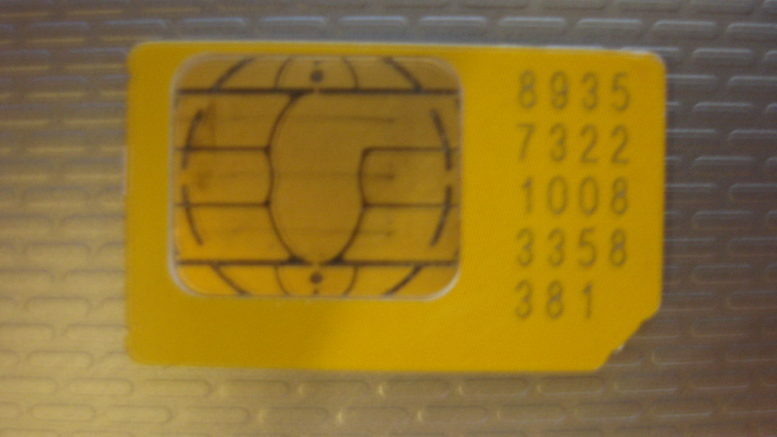 However having no SIM at all is very rare, at least as I’m writing this article. So, in order to change carriers, all you should have to do is remove one SIM and put in another. That should be all there is. The phone number would change, and you could even use a different cell carrier. Often times that’s not all there is. First of all your phone may be carrier-locked. In the US, it’s very common for carriers to put software locks on their phones so they only work with that one carrier. This helps the carrier keep you tied to paying them, and that’s important if they gave you that phone for a discount price. It’s not as common as it used to be, though. Most premium phones today are sold “unlocked” and that’s fine. If you’re paying $1,000 for a phone you should expect to be able to do what you want with it. If your phone is carrier locked, most of the time the cell phone store will unlock it for you without a problem. They are supposed to do this without a charge and without giving you any hassle. Still, sometimes you run into a bit of trouble if you have someone there who doesn’t know the rules. Unfortunately once you’re working with an unlocked phone there could still be trouble. In general you’ll find that you can get voice service from any carrier but each carrier uses different frequencies for data. That means the phone you bought at AT&T might not give good data performance if you take it to another carrier. The same is true with other phones from other carriers if you take them to AT&T. With top-quality phones like the latest iPhone or Galaxy phones, that usually isn’t a problem. Those high-end phones usually work not only with most major carriers in the US but also with most carriers in the world. If you go to Europe you can buy a discount SIM for your time there rather than paying expensive overseas roaming rates. Dual-SIM: The neat way to do it. You’re starting to see some phones in the US where you can have two SIMs all the time. In some cases like the iPhone XS, one of those is an eSIM, in other words it’s built in. The other is a slot for another SIM card. Some Androids have two SIM slots. This is quite common in other countries but it’s just starting to take hold here. With a dual-SIM configuration you’re not pulling out tiny little pieces of plastic every time you want to change configurations. This is perfect if you’re trying to use one phone for work and play. In the evening you can transform the phone to use your personal number with a tap on the screen. In the morning, switch it back to work mode and you won’t be distracted by friends texting you. With a dual-SIM phone you won’t run into any trouble if both SIMs use the same carrier and generally there won’t be too much trouble if you switch carriers. In the US, dual-SIM is used only on the more expensive phones. In other parts of the world it’s actually found in very cheap phones where people bop from carrier to carrier and use prepaid cards all the time.